SilverSneakers® is a national program through select Medicare health plans, Medicare supplement carriers, or group retiree plans. Members who qualify can receive a fitness membership for little or no cost. 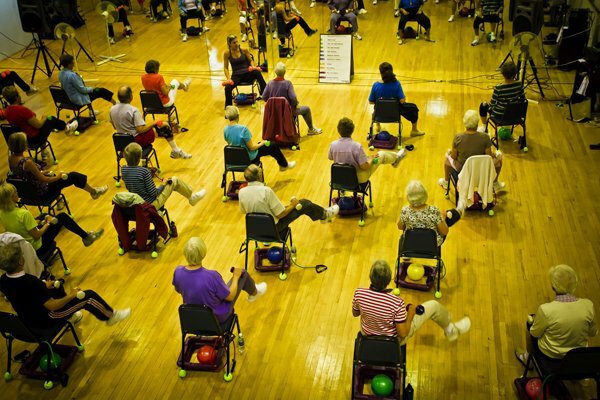 Specialty classes such as SilverSneakers® Classic, SilverSneakers® Circuit, SilverSneakers® Yoga, Boom Move It, Boom Muscle, and Boom Mind® are offered. Call your health plan today to see if you qualify or for more information please contact the club. Silver & Fit program from ASH (American Specialty Health) is another health reimbursement program through certain insurances. If you are eligible for this program you may also receive membership at little or no cost. For members that do not qualify for these programs, Maine Pines offers a special monthly membership that covers the SilverSneakers® classes. It is $30 per month through EFT (electronic funds transfer). For additional information on any memberships, please contact Maine Pines. Have fun and move to the music through a variety of exercises designed to increase muscular strength, range of movement and activities for daily living. Hand-held weights, elastic tubing with handles, and a SilverSneakers ball are offered for resistance. A chair is available if needed for seated or standing support. SilverSneakers yoga will move your whole body through a complete series of seated and standing yoga poses. Chair support is offered to safely perform a variety of seated and standing postures designed to increase flexibility, balance, and range of movement. Restorative breathing exercises and final relaxation will promote stress reduction and mental clarity. Boom Move It®, Boom Muscle®, and Boom Mind® are a combination of 30 minute classes designed to give you a complete workout. You can come for one or come for all! Boom Move It® – is a simple dance workout class designed to improve cardio endurance and burn calories! Boom Muscle® – incorporates athletic based moves to improve upper body conditioning. A toning and strength improvement class! Boom Mind® – takes the best from yoga and Pilates to combine a fusion class. Designed to relax the body and mind with peaceful music and invigorating movements!